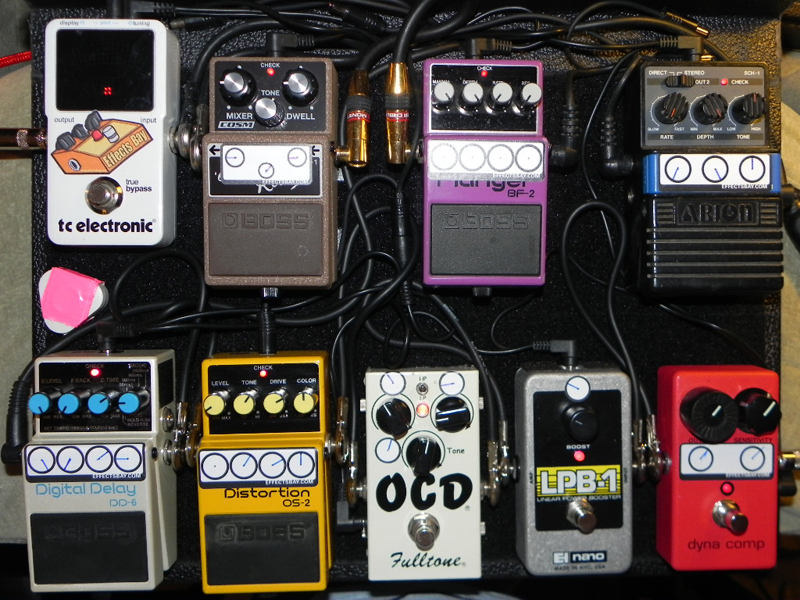 Today’s pedal line is from Jimmy Davis. If you have a pedal line (doesn’t have to be in a board) for your rig, please email me a photo, bio, description of pedals and routing to pedalline@nulleffectsbay.com. Every Friday I’ll showcase a pedal line submission. Make sure you include any links to your band or music page. My name is Jimmy Davis. I’m 54 and having a ball playing in the greatest band of my life, UNCORKED! We are a six piece group from CT ranging in age from mid twenties to fifty somethings. Our drummer and my guitar playing partner are father and son and the origin of our band. We play music from the fifties to the present with five singers, your usual two guitars, bass and drums plus trumpet and sax. This just might be perfect all around pedalboard!